You've probably seen the commercials on TV: a woman falls on her living room or kitchen floor, unable to get to a phone to call for help. The woman may lay there for hours, unable to get up or move. Around her neck hangs a pendant with a red alarm button. When the button is pushed, immediate contact with authorities is made; prompting professionals on the other end of the line to contact fire, police or emergency medical responders as required. A waterproof pendant or bracelet offers an easy-to-press red button in the event of emergencies, and works within up to 600 feet from a base monitor in the home. The medical alert system base unit offers large, easily visible buttons that can be pushed to communicate or signify an emergency. The unit offers an extremely sensitive microphone that doesn't require shouting or loud speaking to be heard by the professional on the other end of the line. The person doesn't have to be in the same room as the base unit in order to be heard. The base unit also comes with a 24-hour battery backup, as well as a beeping or automatic notification when button batteries are low. 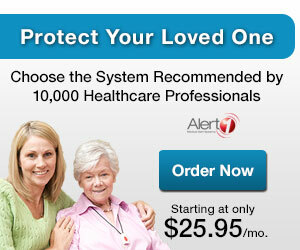 The Alert System is easy to install in a few simple steps. The pendant or bracelet personal button has been designed to offer maximum range for seniors, in their home, front yard, or backyard. The Medical Alert System representative answers immediately, and assesses your current situation and what type of emergency services you may require. They may also call a loved one or neighbor, as long as you have designated them as an initial contact person in the event of an emergency. Are you home alone for hours every day or evening? Do you experience dizziness or have a medical condition that decreases your mobility, or your ability to move about in your home or yard without worry? Have you experienced falls before? Have you experienced a hospitalization or emergency room visit in the past year? Do you have a chronic illness such as osteoporosis, diabetes, congestive heart failure, or chronic obstructive pulmonary disease? Have you had a stroke or are in any way limited or handicapped by arthritis or other medical conditions? Do you take medications on a daily basis? Do you need any help with daily living activities such as meal preparation, dressing, bathing, or grooming? Are you worried about your ability to live independently because of your current condition? Do you currently use assistive ambulatory devices such as a walker, cane or wheelchair? Determine your need for an Alert System based on the above questions, as well as the comfort and security of mind such a device may offer you, especially if you or a loved one lives alone. Unfortunately, nearly 30% of individuals over 65 years of age fall every year, and falls are listed as the primary cause of injury to seniors. Individuals who experience a hip fracture, back fracture, or shoulder fracture are more likely to require admission to a nursing home, with long-term disability, pain and complications caused by fall fractures. Protect yourself and your loved ones by considering an Alert System, especially if you live alone, for your peace of mind, as well as the peace of mind of your loved ones.